What happened? Tell us your tale. In 2005, as a FEMA Community Relations Field Specialist, I was deployed to St. Bernard, Louisiana, truly the “ground zero” of Hurricane Katrina in that state. This was the most tragic thing I’d ever experienced in all my years as a disaster response worker. While working there I contracted a skin infection that was misdiagnosed- for 1 1/2 years!- as a “fungus”. All the doctors I went to refused to culture it, & just kept giving me larger and larger doses of anti-fungal medications, but it kept getting worse and I slowly got sicker and sicker- but I kept working… It was E coli. While I was teaching in Maryland I developed a bladder infection from it, and by the time I got to the WV hospital in 10/2006, it had it developed into blood poisoning, and I had an infection-caused heart attack from it. I was on life support for 5 days, “coded”, was revived, and had my life saved by an amazing Vietnamese-born heart transplant surgeon, thanks to my husband, who refused to let the other doctors bury me. (The head doc told my husband to “call her mother and plan her funeral”). 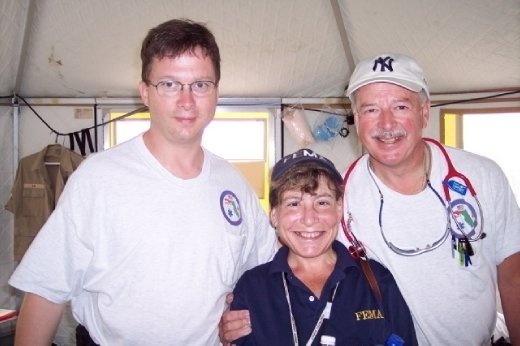 I made a 100% recovery, and was back working for FEMA by the spring of 2007. What advice would you give to other travellers to avoid or survive the situation? First of all, take your health seriously. Disaster workers often keep traveling and working while sick, and I jokingly refer to us as the “walking wounded”. Secondly: Insist on getting REAL medical attention from REAL doctors. INSIST on getting tests (cultures, blood tests, etc.) for illnesses that won’t go away, and don’t be intimidated out of getting tests! If you have to go to a hospital, try to get one with “air scrubbers” so you don’t get pneumonia in the ER like I did- which is what put me on life support. Lastly, try to have someone looking after your interests if you’re not conscious! The only reason I made it through this alive is because my husband wouldn’t let the doctors bury me and INSISTED on them calling in the heart surgeon. World Nomads travel insurance policies (as with most travel insurance policies) do not provide cover when travelling to disaster areas. If you are planning to go to any of these declared areas, please check with your trip provider regarding options for cover. People who courageously help in disaster zones often forgo their own safety in the pursuit of doing a good deed. But if you wind up ill from your efforts, then you could be put out of action for good! It doesn't matter if you are a paid employee of an aid organization, a volunteer, or simply a person on the scene of a disaster, it's vital to be conscious of any potential risks around you. This list is long, and can contain anything from building dust right through to bacteria infested flood waters. We can't give you a tip for every possible hazard, but it's important to use common sense. If you are unsure, it's best not to take the risk. A cautious and smart hero lives to be a hero again, a reckless and hapless hero only gets one shot. If you do find yourself injured or affected by your attempt to help, there are a few vital things you need to consider. First, you need to explain to your medical professional the exact circumstances in which you found yourself to the best of your ability. You need to be clear as to anything you may have been exposed to in the course of action, as a wildly varying prognosis can be given depending on your information. Secondly, and related to the first point, is if you are in unusual circumstances when you are affected, then extra diligence is required. A second or even third opinion from a doctor is always encouraged if you have a condition that you believe to be unusual. The simple thing is, it can't hurt to double check. WorldNomads.com keeps you travelling safely. Whether you’re off for a long weekend, looking for the ultimate adventure or living the nomadic dream, you’ll stay safe with Travel Insurance you can buy online, anytime, and the latest travel safety advice. We’ll also help you share your journey with a free travel blog, flirt in over 25 languages with our free language guides, have an experience of a lifetime on a travel scholarship and donate to a local community development project through our Footprints program.